Anne-Marie DeWitt is a talented designer whose work we really appreciate. 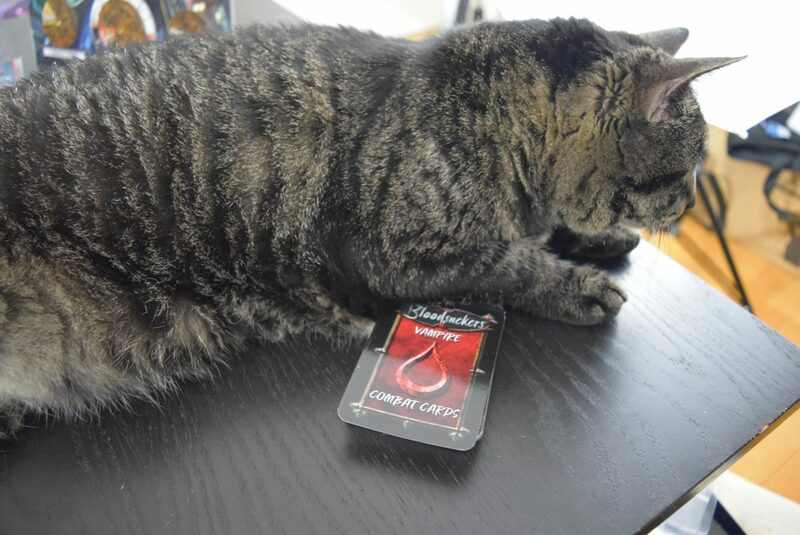 Her company, Fireside Games, has produced some extremely family-friendly games, such as Here Kitty Kitty and Bears!, which is a great little real-time dice-roller. We previously reviewed her game The Village Crone, and we are fans of Castle Panic and its cousins (super looking forward to Star Trek Panic!). All in all, we feel like we know what to expect from Ms. DeWitt, her co-designers, and Fireside – clean design, (mostly) family-friendly themes, and fun, accessible games. What we weren’t expecting was a blood war between eternal predators and the desperate humans upon which they would feed. Bloodsuckers (by Anne-Marie and Justin DeWitt, in case it wasn’t clear) is an area control game for 2-4 players, though at any higher than 2, it is a team-based game (as such, we found it preferable at 2). 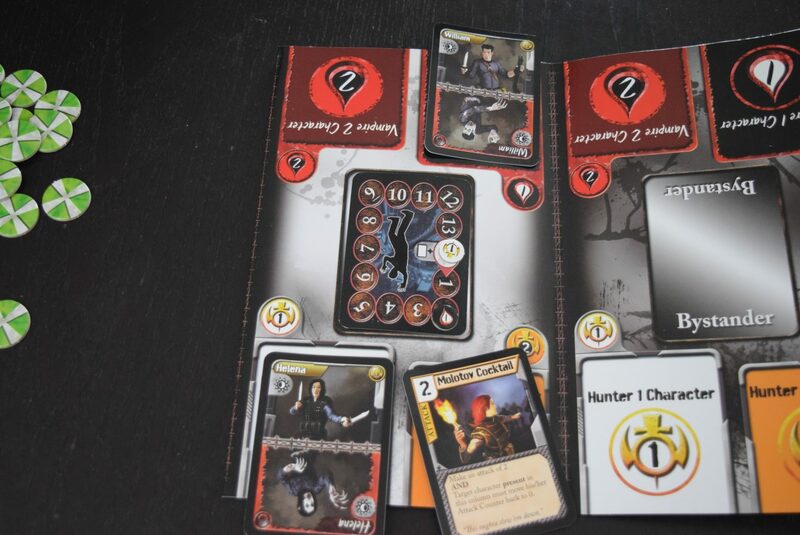 Each player (or team) will take on the role of a faction, either the vampires or the hunters, as they vie for control over Blackwood (a city named, apparently, by my Gothic teenage self). Gameplay centers around hand management/head-to-head card battles as both armies try to recruit bystanders and devastate each other’s numbers. Each round, the lead player will choose one of the unclaimed locations in Blackwood. Based on the location, a number of civilian bystanders will be present, and it is over these souls which players will fight. The ultimate goal of Bloodsuckers is to be the faction that controls the majority of the city, but you won’t be getting any fighting done if you run out of foot-soldiers for your supernatural army. 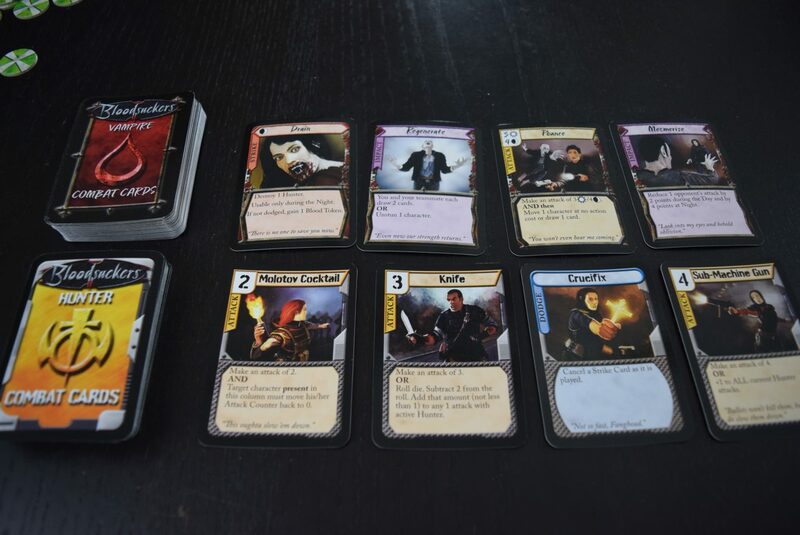 In turns, players will deploy characters from their reserves into the combat zones (columns), and then play cards to raise their attack values. Each side seeks to have a higher attack value than the other, and they can also play cards which will disrupt their opponent’s plays. Here is where Bloodsuckers‘ head-to-head aspect comes to the fore, as players jockey for control over the columns, playing and counter-playing cards against each other. Once the dust has settled, players determine who won each individual column, and then who won the most columns. Each column victory earns a bystander for that player’s faction, and the overall winner takes indisputable control of that part of the city. This process then repeats for each unclaimed territory, and the player who ends the game with majority control wins! Andrew: Now, to be honest, we’re pretty divided on Bloodsuckers. Rob & Diana aren’t too keen on it, and Jess isn’t a huge fan of any game that is nothing but a head-to-head slugfest, but I actually thought it had some really neat stuff going on. Diana: You meant we all disagree with you. Andrew: Isn’t that what I just said? Peanut seems to approve of the Vampire faction. Rob: You’re the worst. Well, for my part, I guess I just felt like there wasn’t a huge amount of decision-making to be done. Sure, we could deploy different warriors to different columns, and many of them have unique traits or abilities that lend a little complexity to the game, but at the end of the day, it was still a game about pushing your number higher, and hopefully pushing your opponent’s number lower. Andrew: I won’t disagree with that assessment. Diana: The art’s a little cheesy. Andrew: Oh yeah, no argument there. Jess: And what’s with the plastic playmat? Andrew: Honestly, I have no idea how that mat got past prototyping. I mean, cost-cutting, I’m sure, but come on. Rob: So…what do you like about it again? Andrew: Well, everything you guys just said, actually. Aside from the board – there’s no excuse for that thing. Andrew: Ok, hear me out. 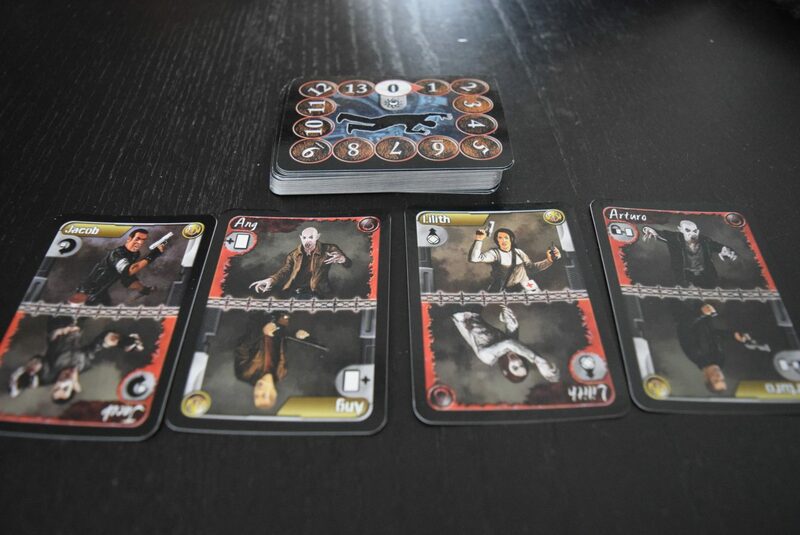 Bloodsuckers isn’t a deep or mature game, either in design or theme. It is a simple head-to-head game, and its certainly not going to be for everyone. However, one of the things I appreciate about it is how it introduces the idea of more complex game mechanics (countering actions, vying for control, swapping cards/units as tactics change) in an approachable way. It’s not really a gateway or a teaching game, but there is something oddly satisfying about the distillation of a formula into its component parts, and it somehow makes the whole thing family-friendly, at least inasmuch as arterial spray and unholy hunger can be. And for as frustrating as it is when someone manages to block, dodge, and counter their way through all your best cards, it is equally satisfying when you manage to do it yourself…or when you finally eat that pesky Hunter you’ve been tracking. Rob: Yeah, alright, that’s all fair to say. It was fun getting to trounce you when it worked. I guess I just felt sorta ‘meh’ otherwise. But I get it. Andrew: I also like how both factions feels different. Not, like, earth-shattering uniqueness, but Vampires bite, mesmerize, and drink blood, and Hunters bring guns, stakes, and bigger guns. They play just differently enough that they feel unique, and it will be several plays before you feel like you’ve seen everything that each deck can do. And I also love the day/night mechanic, with some characters and abilities having their efficacy changed depending on when the battle is taking place. Jess: Ok, when you put it like that, I can see where you’re coming from. It’s not for me, but that doesn’t mean it’s a bad game. Andrew: And I like the slightly cheesy art, at least in context. It’s colorful and comic-y and it totally fits the world of Blackwood, with all the teenage Goth angst that the name implies. I love that Bloodsuckers it takes itself so seriously without asking us to take it so seriously. It’s a game that embraces its tone, and I appreciate that. So, no, Bloodsuckers isn’t a groundbreaking game, and plenty of gamers will outgrow it relatively quickly, but the fact is that it is enjoyable and well-designed for what it is, especially when played as a 2-player game. And for some players, particularly younger ones (maybe certain angsty teens? ), it will be a great stepping-stone into other, more strategically complex games.